When building our home I took into account that I would require space for a workshop. I had a three car garage built but only opted for two car spaces. 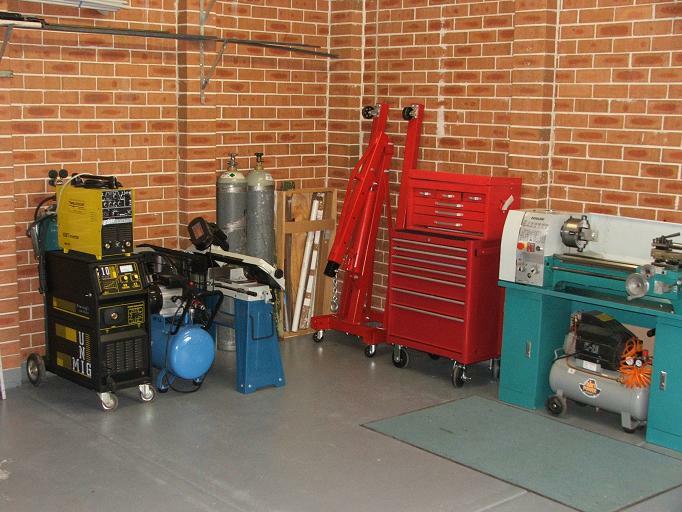 The third garage space was dedicated to the workshop area and a roller door was not installed. The ceiling in the garage is 2900mm to enable storage space and plenty of headroom. This is crucial, as you will sometimes need to ensure you have space for additional future requirements, from headroom to technology or automatic roller doors. There is no storage in the roof itself due to the design of the roof structure ( timber trusses ). In my last house I did a similar thing on a smaller scale. Unfortunately that workshop was built in front of a roller door and was removed when we sold the house. A mate of mine ( Alex ) who now resides in Switzerland coined the name “Bootka” in relation to my workshops. “Bootka” is a Russian word that means booth. I like plenty of room but I also like things cosy. A Bootka always solves the problem well. 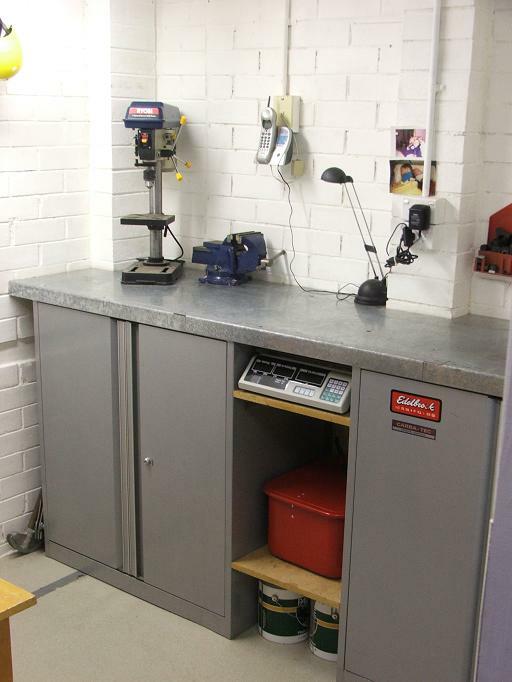 My intention was to contain all of the machine tools within the workshop room however things have gone a little askew. 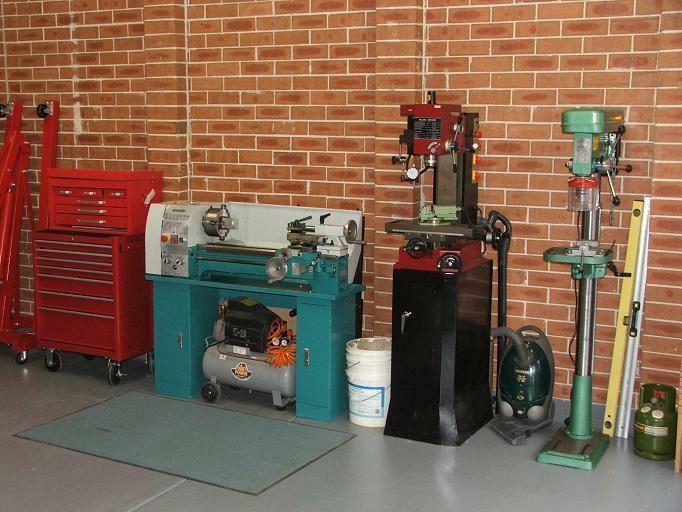 There was not enough room to accomodate the machinery so I have shifted the machine tools to the far side of the garage. I only have one car so it is no issue. I am very pleased at how things have turned out. I have far more room to move when machining and am able to utilise the workshop area as an assembly / dissasembly zone for my various projects. I have also installed a desk and a PC which is critical for internet info at ones fingertips. 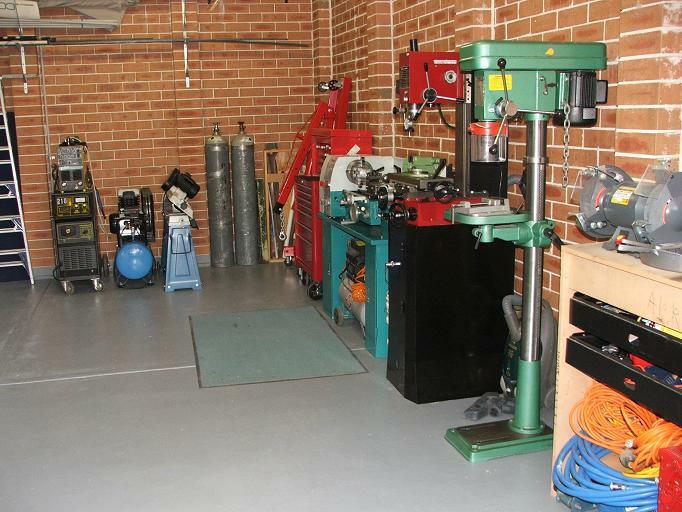 This is the position of the workshop with reference to the garage. I put a 45 degree entry to the corner of the workshop to enable easy pedestrian flow. Also it is good for chi energy if you are in to feng-shui. Note I also have a 45 degree corner on the workbench. This is a perspective view of the workshop. The 250mm lip around the front prevent anything that is stored on top from being accidentaly pushed over the edge. This is a shot of the inside of the workshop as it now stands. The benching remained. The vice is yet to find a permanent mount so I currently only bolt it in when I need it. The small drill is used for plastics and wood when I need a quick fix for a hole. The computer and desk are on the opposite wall of the benching in the above photo. There is still plenty of room to move around. Safety is the most important thing in a workshop. Keep your equipment handy. This is a shot of the new layout. The floor has been painted with special floor sealer. The rubber backed mat in front of the lathe is for operator comfort. An additional benefit of having the machinery set up here is that I can open the roller door and let in an abundance of natural light and fresh air. A shot of my 2 apprentices.